Feel confident that your prized rabbit, exotic chinchilla or adorable guinea pig is safe and comfortable in the SunGrow Natural Woven Grass Bed for Small Pets. Made with high-quality all natural materials, the fun and functional grass bed is safe for your pet to chew on and sleep in. Because the raw, plant-based materials used to make the Natural Woven Grass Bed are safe for consumption, it can also be used as an edible bowl for any of your animals. Add some grass, hay or straw to the natural bowl and let your pet munch away. The SunGrow grass bed is lightweight and can easily be carried (with or without your little friend) inside and outside. Place the practical Natural Woven Grass Bed inside your pet's cage to protect its sensitive paws from the hard, wire bottom of the his or her happy home. Designed at a size to comfortably fit small pets so that they feel secure without cramped, the SunGrow Natural Woven Grass Bed for Small Pets is the perfect cradle for your adorable little critter. Responsible and loving small pet owners around the world agree that a natural woven grass bed is the best choice for their cherished furry family members. PROTECTS YOUR BELOVED PET'S PAWS - Small animals like chinchillas, guinea pigs and rabbits tend to have more sensitive little paws. The grass bed acts a protective barrier between your pet's dainty paws and the hard wire cage bottoms. 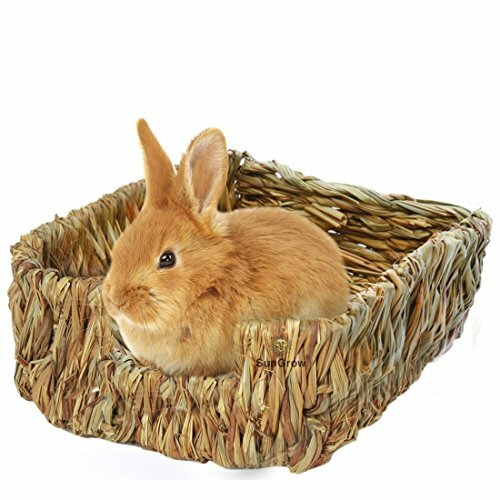 PERFECTLY SIZED TO FIT INSIDE OR OUTSIDE A CAGE - Aptly sized at 9" long by 8" wide and 3" deep (230mm x 180mm x 85mm), the SunGrow woven grass bed can easily be placed inside most small animal cages. Outside of the cage, it is compact and can be moved from place to place without any hassle. RELAXING FOR YOUR ADORABLE PET - The natural woven grass bed has its own organic grass fragrance that makes the pet feel relaxed, as if they are in their natural homes. VERY LIGHTWEIGHT & PORTABLE - At a barely noticeable 2.5 ounces of weight, the natural grass bed for small pets can be picked up and carried just about anywhere. Take your napping pet from one room to another without disturbing his or her slumber. SAFE TO CHEW WITH 100% NATURAL MATERIAL - Chewing is a perfectly natural behavior for small animals and many small pets love to chew on wood, hay, straw and other organic materials. Because the SunGrow woven grass bed is made of natural materials, it doubles as a chew toy for your pet. Derived from the earth, the raw materials used in this woven grass bed are extracted directly from 100% natural, non-synthetic products with minimal processing. If you have any questions about this product by Luffy Pets Collection, contact us by completing and submitting the form below. If you are looking for a specif part number, please include it with your message.